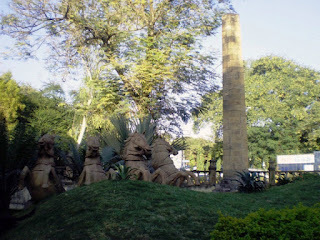 Zero Mile is a stone pillar locating the geographical center of India in the city of Nagpur, Maharashtra. The Zero Mile Stone was erected by the British who used this point to measure all the distances. The British considered Nagpur as the center of India. Being at the centers of the country, they also had a plan to make Nagpur the second capital city. The Zero Mile Stone consists of four horses and a pillar made up of sandstone. Each horse denotes a cardinal direction. The Times of India Group has taken the responsibility to maintain this as a monument since 2008.